82 years after Democrats voted to support the Ku Klux Klan, the Democratic Party is finally taking a look at racism inside the party. It looks like several democratic party leaders are finally taking a look at the ugly, racist, and anti-Semitic tirades that are all too common on the Left. The Democratic party was an uneasy coalition of diverse elements: Northerners and Southerners, Westerners and Easterners, Catholics and Jews and Protestants, conservative landowners and agrarian radicals, progressives and big city machines, urban cosmopolitans and small-town traditionalists. On one side were defenders of the Ku Klux Klan, prohibition, and fundamentalism. On the other side were northeastern Catholics and Jewish immigrants and their children. A series of issues that bitterly divided the country during the early 1920s were on display at the 1924 Democratic Convention in New York, including prohibition and religious and racial tolerance. The Northeasterners wanted an explicit condemnation of the Ku Klux Klan. The final vote was 546.15 for the Klan, 542.85 against it. 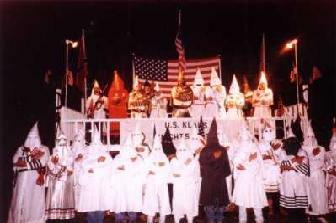 Newspapers called the convention a “Klanbake,” as pro-Klan and anti-Klan delegates wrangled bitterly over the party platform. Is it no wonder, then, that democrats do not want this Black Republican radio ad (posted previously) on the airwaves? The pictures of Black Republican candidates were added. This ad was not endorsed by any of the Black Republicans pictured. Obviously, the fact that democrats actually voted to endorse the KKK in 1924 would make this AP report factually incorrect. La Shawn Barber shares her thoughts on the uproar over the radio ad. But regardless of their own KKK history, the democrats will always use accusations of racism in their personal attacks on Republicans.